On a rock outcropping near the lake at Still Mountain Center is a carving. It is best seen as the sun sets, with light cast across the carving, creating a deep shadow. 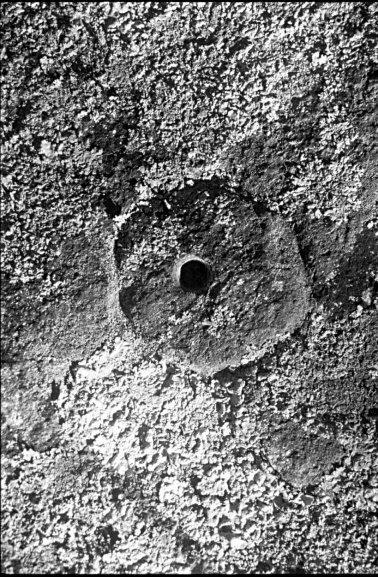 It is a circle, four inches in diameter, with a dot in the middle carved into the gray granite about 1/4 inch deep. Years ago, when we first explored the property, we found this carving, along with arrowheads and other Indian artifacts. We investigated its origin and meaning and learned that it is a petroglyph carved in all likelihood by a member of the Weantinoge American Indian tribe hundreds of years ago. The symbol means "The Great Spirit" that exists where earth, water and sky meet. When we conceived the idea of Still Mountain Center, even before we found its name, we knew that the carving would be the symbol to represent our intention for this center. Our logo, shown above, is a sumi brush painting of that carving, painted by artist Ananda Saha, one of the founding supporters of Still Mountain Center. This symbol speaks to the core of our organization. Still Mountain Center celebrates bringing elements together within ourselves and in our world, an intuitive matrix of elements which combine earth, water, sky, with body, mind and spirit, as we aim to integrate and balance these elements of nature within ourselves. We do this in our art, in community and in lives lived creatively.